A happy, SNOWY coffee Monday. In LATE MARCH, Washington DC! Luckily I’m working from home today — I can bundle up in sweats, or hop over to one of my favorite local coffee shops, Kafe Bohem, for a coffee. I usually go for their einspanner (coffee with whipped cream), and I love their flaky wafer cookies they give you gratis. Yesterday I bought one of their sesame kolache — delicious, not too sweet, reminding me of the sesame paste-filled “klatchkey” cookies my grandma used to make. I’ll be back for more soon! 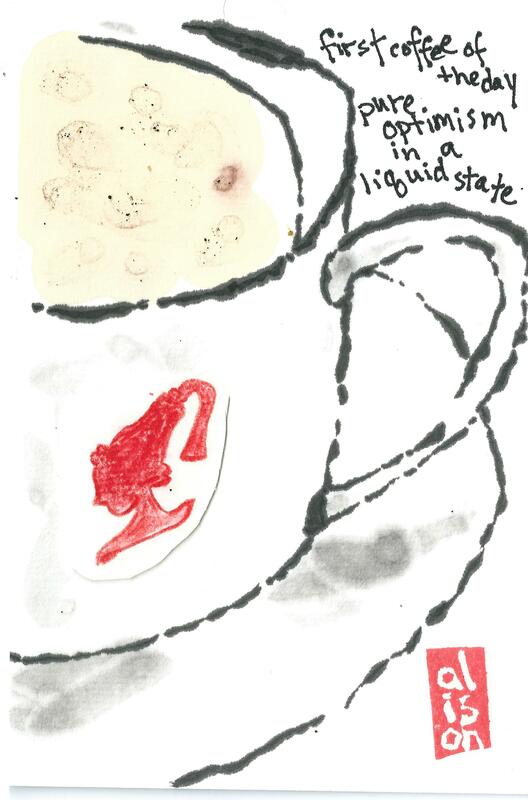 Kafe Bohem’s Meinl coffee cups, with the red silhouette profile, inspired today’s etegami. Apologies for the recycled quote, from Carlos Ruiz Zafon — I used it a couple weeks ago in this post, but it’s a good one. I also have a recycled motif this morning, used here in this post, but with the first one I have tried a different technique, collage. Collage is a new style for me. The coffee cup portion was one of my practice drawings, which I usually do on random paper. I rather liked the result and cut it out a few weeks ago, thinking of what to do with it. 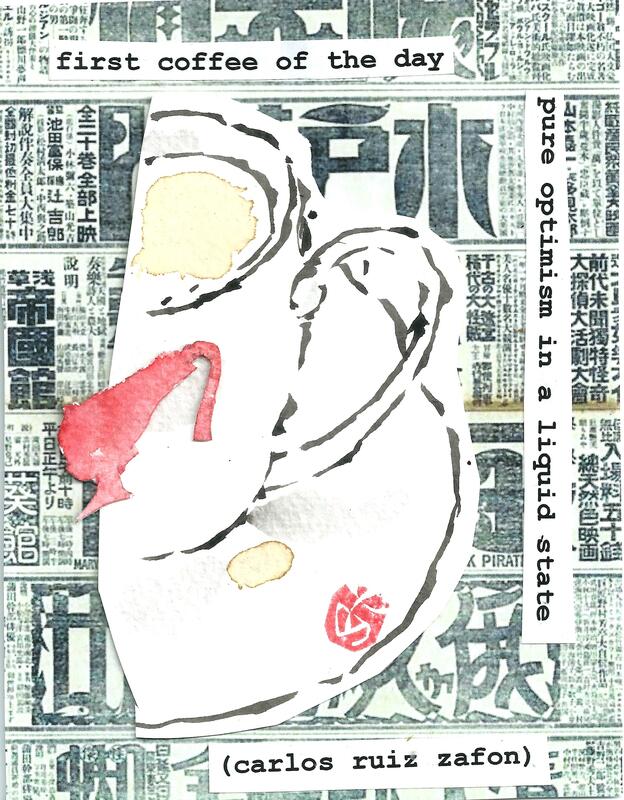 I found the Japanese newsprint on Pinterest, and decided to try out collage, again with Zafon’s quote. For both etegami here I cut out the Meinl silhouette from paper, colored it red, and pasted it on.